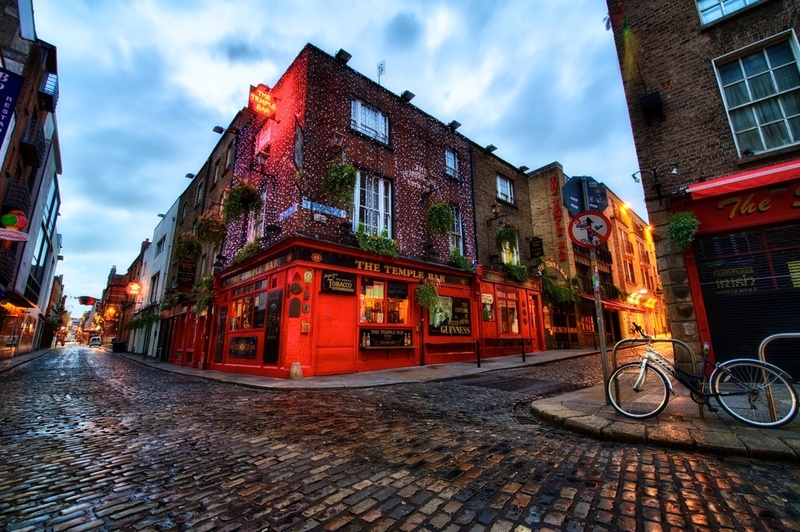 This is the famed Temple Bar located in the historic district in downtown Dublin, Ireland. It's a wonderful place. When I found out I was going to Ireland, this was one of the top places on my list to photograph. I arrived late on Saturday, so instead of fighting the Saturday evening crowds, I decided to get up on Sunday morning so I could enjoy it alone. It works every time - all the tourists are in bed, and I am firing off brackets to my hearts content. I ended up coming back by on Sunday evening, so I got some night shots here after all! The entire area is actually called Temple Bar, and consists of several blocks of these historic buildings with many Irish bars scattered around. It's quite fun, day or night! Bring the camera!